Another personal grouse is showing edges, centrelines and dimension lines as all the same weight. BS 308 (when I learnt it 45 years ago required the edges to be a heavier weight. I've a marginal preference for 1 over 2, on the basis that the drawing should carry all required manufacturing information in preference to any cosmetic enhancement, and there appear to me to be missing dimensions. I was a tool designer in the late 70s/early 80s and recognise your grouse. I can remember one very experienced designer who used to draw his tools using the same thickness for all lines, entirely in 3H pencil, and might throw big, complex bundles of dimension lines long distances across a sheet of A0 draughting film. The toolmakers all hated him, and would accidentally-on-purpose manufacture his designs exactly as drawn, with hostile disregard for any errors. Mick, could you let me know what dims you think are missing please. Well, I'm not seeing overall thickness of the casting anywhere. I've looked several times - have I missed it somewhere? Come to that, the corner pads and hole positions, don't seem to be dimensioned either, nor overall length/width. And I'd have to make assumptions about the x-position of the left-hand holes on the left-side rectangular pads, whereas that of the left-hand holes is specified. However I think as part of the package I will do a few sheets with coloured general arrangement and some sub assemblies possibly sectioned too that can be viewed on the screen to get a feel for how things go together much like this which I have just quickly put together. May also do a fancy rendered one too which I did start on a while back. There will also be my usual 100plus build photos available. Maybe because I'm a beginner, but that's exactly the sort of drawing I find helpful as a supplement to Option 1. The restrained use of colour makes this example a good one of the type. Photographs of the build process are a massive bonus too. I much prefer metric for new designs. Another debate might be the amount of detail allowed on a single sheet. Given the choice I prefer uncluttered - one part per page. Unfortunately that takes reams of paper! It's not essential either. I successfully built the PottyMill engine from a plan where all the parts - in colour - had been squeezed onto a few sides of A3 making it quick and cheap to print. In theory I didn't like the clutter. In practice the plan was entirely serviceable and it was actually an advantage to be able to scan several parts in one go. However, successfully packing a drawing to a high density might be the ultimate test of a draughtsman's skills! 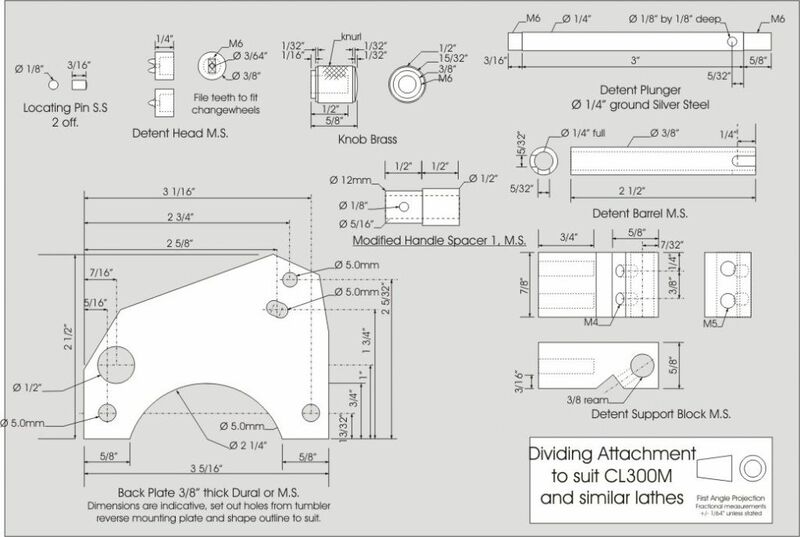 My personal preference would be option 1, I have only been a consumer of drawings since I left school but my engineering drawing teachers were both of the opinion that a drawing should only have the minimum information to make the part and dimensions should only appear once to avoid cluttering a drawing and avoid having to correct in multiple locations if mods are required. The holy grail is a drawing that avoids confusion and misinterpretation and conveys all required information. If reference to the draughtsman is needed then he has failed but everyone makes mistakes apart from the bloke who never made anything. I sometimes think my mentors policy was a bit severe but drawing interpretation was part of the teaching and they had some drawings that made you think a bit. A good drawing should make the task of the guy making the part as easy as possible. Aaargh! Sorry - think I meant the right hand holes on the left-side pads! Mike Poole's post makes the point very well, I think. A supplementary illustration, in colour, 3D, or whatever, may be interesting/helpful ... but the drawing itself should remain true to his teachers' advice. I did not show a thickness as it is not a critical dimension, really just skim the bottom so it does not wobble. The 0.062 for the round corner fixings could just as well have been a spot face, the 0.125 is the only one that really matters as things could clash with the base if less. Regarding the 8No 5BA holes to the left I went for the assumption that most people would take them to be a mirror image of the right hand side. The only dimension on the left extends down to the 3.0mm CSK hole and positions that and the one lower down. SOD, I try not to put too much on a single sheet to avoid clutter buy may place 3 or 4 small related items on the one. Sometimes it is difficult when you have decided to constrain yourself to one sheet size and you get a part that needs several views and maybe a section as well as having a lot of dimentions etc. On this particular engine I have had to put the cylinder onto two sheets as scaling it down so all the views fitted would just clutter the dimensions etc too much. If I had gone upto say A3 or A2 most people would end up printing bits on A4 and putting together anyway so no real harm. Ah - context is important. I should've thought of that. I'd assumed that it was for issue to a foundry and machine shop, intended to cover both casting and machining. Of course, if it's for issue with a set of castings in an ME kit, it'd be obvious it was intended only to cover machining. Nevertheless, I'd expect the corner hole spacing to be dimensioned - Anthony Mount did so on the base of the Hypocycloidal I built last year, though only from one edge and without the 'typ. <n> posns.' I think I'd probably have put in. But I'm carping - it's always a helluva lot easier to comment on the work of others than to do it yerself! Firstly thanks for your consideration for the needs of your "customers". My difficulty is sometimes visualising the shape of the part from the drawing so the addition of an occasional 3D image is welcome. The rendering of the intended result is also useful so I know where I am headed. My preference of your options would be 1 or 2. Dimensioned in metric, on uncluttered A4 sheets in PDF format. Jim, hopefully you will get what you ask for as that is what was on the Jowitt drawings that you made. The subject of holes in bosses is an interesting one. I could as Mick suggests dimension the hole from two edges but all to often you see a model where someone has followed these dimensions to the letter and you get a hole that is well off from the boss as the casting did not end up like the designer had intended (as in this case). Worse if the builder does not take the trouble to tidy up the boss afterwards so it is uniform around the hole. Though out of context you don't know if these 4 holes should match those in another part in which case dimensions should be given. I have recently made a couple of engines from American casting kits and these had the "COB" that I have used here which stands for "centre on boss" and results in an aesthetically pleasing hole that is smack ban central to the boss, obviously only works for things like these mounting holes which are not critical as they will just be used to screw or bolt it to a display base. Going slightly off topic (sorry) some years ago the company that I was working for at the time decided to try a new vendor for cable loom manufacture, these looms were for electronic chassis and were drawn at full size on A0 sheets. These were then pasted onto sheets of plywood and nails inserted at each change of direction, the wires in the loom would then be routed around these nails and laced or tie wrapped together and connectors or terminations added. These A0 prints were black and white except for a very prominent note printed in red at the bottom of each sheet that said "Do not scale drawing". The new vendor proudly submitted some samples to us for evaluation which were not much use as he had printed out the electronic file onto A4 paper! This meant that the samples ended up being approximately 5 times smaller than they should have been, he was quite miffed when he didn't get the contract! Another thing that I can include in the package is a 3D PDF where you can zoom in and out on the 3D model as well as move it all about. You can play about with lighting, colour or just get a line drawing and transparent is handy too. Can I throw in a googly? I have a personal preference for a VERY pale shading, say a 5% gray, for the background. This makes it very obvious what are holes through a part and what are raised features, and also makes it clear that dimension lines are not part of the object. This will no doubt be unpopular with some but I find it helps me 'read' drawings, especially ones with lots of parts. I find many 3D drawings distracting unless they are needed to help visualise a particularly complex part. I can live with or without colour on 3D. Whatever you do, avoid the awful kids' crayon efforts that appeared in ME with Keith Wilson's GWRillian series. It certainly didn't help that production problems with ME at the time caused some of them to appear almost blank! My preference (Assuming you will print drawings) is for standard orthographic views as line drawings (Avoid too many hidden lines - add another section view if necessary) and pictorial/isometric line views if needed to illustrate a point. Pictorial views can be rendered, but I think it's mostly unnecessary; it could be considered showboating because you have a flash 3D CAD system. Jason, I guess I am fortunate in that I can read and understand drawings but I would imagine that there are some beginners/newcomers that struggle with them, in particular visualising the finished shape of some parts from just a three view drawing. As some of your projects are aimed at beginners I think your idea of including coloured general assemblies and possibly sub assemblies (some sectioned) I think a good idea and would be invaluable to them.